Preheat oven at 350ºF. Lightly grease bottom and sides of jelly roll pan, 15.5×10.5 x2 x1 inch. Combine all ingredients, using hands or spoon. Form 1 inch balls with mixture and place in pan. Bake for 20 to 25 minutes or until brown. Immediately remove from pan. 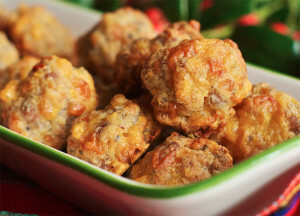 Serve sausage cheese balls warm with optional dipping sauces. Note: Add additional splashes of milk if mixture is too dry/not holding all the dry ingredients.